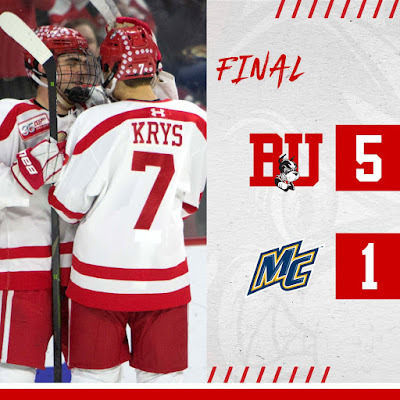 Five-point performances by Chad Krys (2G,3A) and Dante Fabbro (G,4A) powered BU to a 5-1 win against Merrimack on Senior Night in the final regular season game at Agganis Arena. 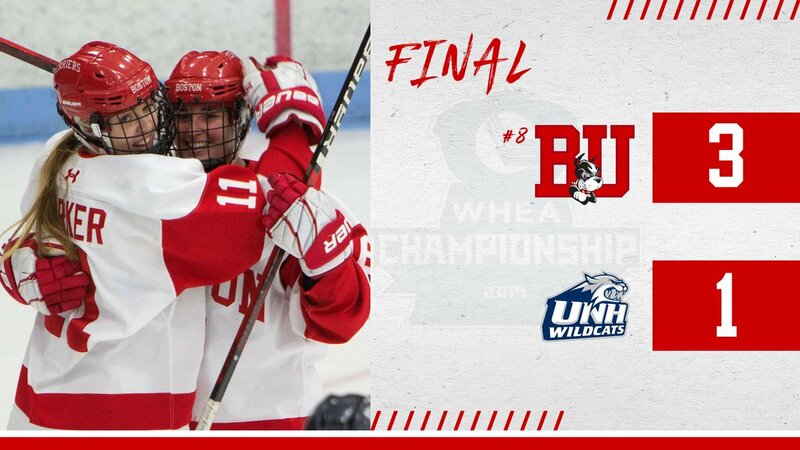 The win, which extended BU’s unbeaten streak to five games (4-0-1), kept BU in sole possession of fifth place in the Hockey East standings with a chance to move up to fourth—and a home ice slot in the playoffs—next weekend. BU would need to defeat Maine and either a Vermont win or tie against Lowell or a New Hampshire win against Northeastern to gain the final home ice slot. Following Senior Night ceremonies, BU took an early lead on the power play. Fabbro, who had to pick up a new stick after his had shattered, took a pass from Joel Farabee, skated to the right faceoff dot and wristed a shot through Craig Pantano’s five-hole. Midway through the period, with BU on the penalty kill, Fabbro sent a long pass to Ty Amonte, who broke in alone and beat Pantano with a slick forehand-backhand-forehand move. BU extended the lead three minutes into the second period, again on the power play. Fabbro and Bobo Carpenter—back in the line-up after missing 10 games—set up Krys for a one-timer from the top of the right circle. Merrimack got one back at 7:34 when Tyler Drevitch beat Jake Oettinger on an uncontested shot from the left dot. Just two minutes later, with the teams skating four-a-side, Krys beat Pantano again from the right circle with Fabbro and Shane Bowers assisting. BU scored the only goal of the third period, its third power play goal of the night. Farabee produced a highlight reel tally taking the puck in BU’s defensive zone, splitting two defenders at the Warriors’ blue line and beating Drew Vogler—who had replaced Pantano—with a backhander through the five-hole—and making it look easy. It was another active night for Oettinger, who stopped 32 shots in 52:27—including 17 in the first period—before being relieved by Max Prawdzik, a Senior Night honoree who made four saves. Along with his assist, Carpenter, who centered the third line, won 11 of 17 draws. Fourteen of Merrimack’s 37 shots came on power plays with BU killing all eight Warrior man advantages while scoring one shorthanded goal. “It was a good win, for sure. Scoring five goals this time of year gives us confidence. Special teams are going to be important and our big guys stepped up,’’ said Head Coach Albie O’Connell. 2019 recruit Robert Mastrosimone scored his 23rd goal and assisted on two others—including the game-winner—as Chicago edged Dubuque, 4-3. 2020 recruit Drew Commesso stopped 23 shots in the NTDP U17s’ 3-0 loss to Sioux City. Alex Chiasson scored his 18th goal in Edmonton’s 4-0 shutout of Columbus. David Warsofsky’s overtime goal pushed AHL Colorado past Tucson, 3-2. He also added an assist. John McCarthy scored his 9th goal in the San Jose Barracuda’s 5-2 loss to Bakersfield. Adam Clendening scored his 4th goal in AHL Cleveland’s 3-2 loss to Toronto. Paced by a pair of goals from redshirt junior Sammy Davis, the #8 Terriers completed a sweep of their best-of-three quarterfinal series with New Hampshire, defeating the Wildcats, 3-1, at Walter Brown Arena. The victory, earns BU a spot in next week’s Hockey East semifinals in Providence against Boston College. First period goals by Davis and Deziray De Sousa gave BU a lead they would never relinquish. Davis's second goal--her team-leading 25th--early in the third period stretched the lead to 3-0. A shorthanded goal by UNH ended the shutout bid by Corrine Schroeder who stopped 27 shots. ● Video highlights and Coach Brian Durocher’s post-game comments .